Where I grew up, there were (are still) 3 drive ins. Now, in Jersey, there is ONE drive in in the state... and it is (fortunately) close to me. It's not the nicest, but it is so much fun. Love this, and I hope it gets saved! I've never been to a drive-in, can you believe it? There's one on Cape Cod and when I go next week, I plan to leave the kids with their grandparents and sneak out alone. It will be delicious. And then I'll come back here and tell you, "You were right!!!" 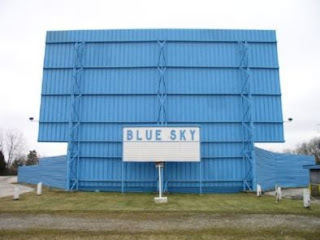 Having grown up in probably the same area code, I remember all the old drive-ins. Tne Gala, Montrose, Blue Sky, Ascot, and East in Tallmadge. Ironically, where the East used to set on Darrow Rd, our Ryan development butts up against where the parking lot ended. Lots of good times there. We still have a drive in and they did the upgrade to digital a few years ago. I think it was $20 for 4 of us to see 2 movies. This year was the first time they didnt allow you to buy a food pass for $5 to bring in coolers of food! Oh no! I wish I read this a month ago, I hope it all worked out! Thanks for visiting my blog, I always make it a point to return the favor! We have a few days left because they opened up a giveaway for four more - but only until the 19th. I just found it - thank you! I had totally overlooked it. Sad to hear when iconic places like this fade away. I hope it can be saved -- somehow, some way. Hey there! Just wanted to say thanks for the follow on bloglovin'! I'm happy to be following you back :o) Hope you're having a great Tuesday! it makes me so sad that they are closing them down. I think I heard our's is getting shut down also :(. I hope your's gets saved. oh no!! i love drive in theaters... there arent really many around my area any more. but i remember going when i was a kid and its the best. i'll try my best to help save them too! thanks for letting us know! I wish they could be saved! Once one goes out, it never comes back. I think they could raise their prices enough to pay for new equipment. People who appreciate drive-ins wouldn't mind. I grew up go to drive-in movies. Such great memories. What a shame and I hope that it managed to make it. Our local one, the only one in the area didn't. How sad that future generations won't know the joy.